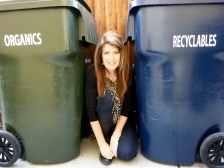 California Homeowner Makes Recycling Fit Her Lifestyle! Greener homes begin with learning how to avoid waste and make recycling convenient. Homeowner and writer Monica Wilcox shares her recycling program story. Tell me you’re not addicted to convenience and I’d have to call you a liar. Our culture LOVES convenience: Clap on Clap Off, drive-thru, timers, DVR. We can’t wait for the next great invention. I wonder why, after a century of popularity, “convenience” hasn’t made our lives more stress free. And then there are the “disposables”: wipes, brooms, contacts, razors, forks, plates, underwear…spouses. Why, the medical industry alone has made disposable a veritable quest. The only thing my doctor touches me with that is reusable is his stethoscope. Even that thingy-majiggy used to check my ears has a disposable liner. If you’re going to live green you’re going to have to make it convenient because the last thing Mother Nature wants to be is your greatest burden. Since our society has not made environmental living the easier choice that leaves us holding the recycle bag. Recycling-Easy as 1, 2, 3… and 4? On a recent survey I was surprised by the number of people who listed “recycling” as the number one thing they could do to improve their lives. Luckily, it’s one of the easiest green habits to pick up.